This entry was posted on September 4, 2015 by Tinteán Editorial Team/EMcK, in Drama, History, News, Of Literary Interest, Poetry, Theatre Notice, What's On... and tagged Celtic Club, drama, Emigration, entertainment, Irish culture, irish diaspora, Poetry. Bookmark the permalink. Please bring your friends. Parties of 6 attract a discount. All proceeds, bar an honorarium for the actor, go to Bloomsday 2016, about which we’ll tell you more after the show. Hope to see you there. A modern day epic poem following four generations of one family from Ireland to Australia and back again. Complete with sea-voyages, battles with monsters, and a bit of boozing, Once Upon a Barstool is a modern adventure in storytelling. In 1954, Sean says goodbye to his father, turns his back on Ireland and his Irish-ness and sails for a new life in Australia. Fifty years later his son, Stuart, drunk and lonely, finds himself at the bottom of Two-Fold Bay, homesick for a home that he never even knew. Meanwhile, his own son, Mick, an 18 year-old Aussie backpacker, who has arrived in Cork for the first night of his European adventure plays a game of pool he will never forget! And what of the letters, given to Mick by his grandad the night before he left…? Felix Nobis (Dr. Simon Lloyd, MDA; Rob Griffin, JANUS) is completing a PhD in medieval storytelling at Monash University. He lived for 10 years in Ireland where he wrote a translation of Beowulf, which he toured the world as a one-man show and was praised by Ireland’s Nobel Prize winning poet Seamus Heaney as ‘enthralling to a contemporary audience’. A theatrical experience not to be missed – we do hope you can make it along. 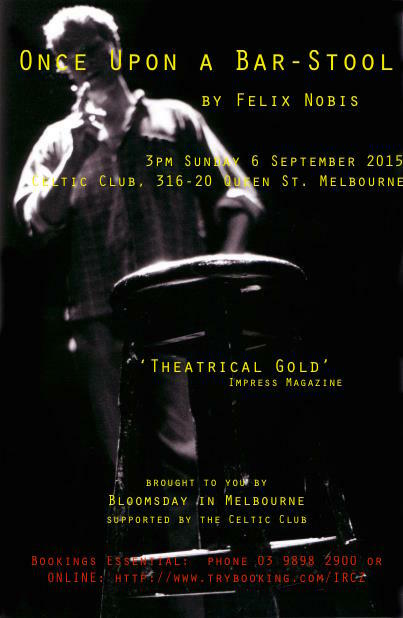 Bloomsday in Melbourne thanks Felix for donating his services as a fundraiser and the Celtic Club for its support.